The nuclear industry has recently undergone what the nuclear lobby called a ‘nuclear renaissance’, with several countries planning to construct or constructing new plants or prolonging the life of existing reactors. However, this ‘nuclear renaissance’ has encountered difficulties in Europe: new reactors currently under construction in Finland and France have been delayed and are running over-budget, while in Germany, Belgium, Switzerland and Italy nuclear energy expansion has been put on hold in the aftermath of the Fukushima accident. In the present report we explore the situation in Bulgaria and Slovenia. For both countries nuclear energy is an important part of the national energy mix and both have plans for new nuclear power plants (NPPs). We closely analyse the history and present situation of nuclear energy in these countries and the internal debate that has evolved in relation to the construction of new plants. Despite many particularities, there are common traits that are also shared in the rest of Europe, notably, the debate over whether to maintain and/or increase a powerful and relatively autonomous source of energy in the face of the high costs of construction and environmental and health risks nuclear energy and radiation entail. The report describes the expansion of nuclear energy – two new planned power plants in Bulgaria and the prolongation of one plant and the construction of a second one in Slovenia. First an overview of the energy mix in both countries is offered. Then a chronology of the nuclear projects is outlined, highlighting the main risks and problems, including social and environmental issues. This overview concludes with an analysis of the cost and benefits of the planned power plants. 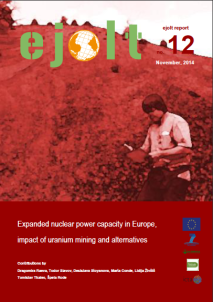 We also look at the often forgotten first stage of nuclear energy production: uranium mining. We describe the current status and main problems of the closed mines of Bulgaria and Slovenia. Then we analyse alternatives to nuclear projects by focusing on different energy scenarios. With the objective of envisioning a sustainable energy future, we analyse the costs and benefits, and thus the potential for Renewable Energy Sources (RES) as an alternative to NPP expansion.